The "Smokey Goat Towable Topper" is professionally made in Rotorua, New Zealand. 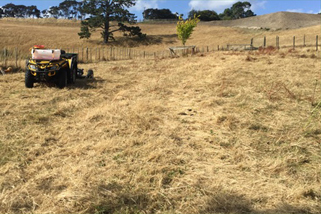 It was originally developed after recognising that many lifestyle blocks, orchards and equestrian properties do not own a tractor, yet still need to be able to maintain pasture quality for stock and keep paddocks and properties tidy. Our 1500mm topping mowers are also very popular in the Horticultural sector for controlling grass and weed growth between plant rows, next to posts or fencelines due to the moveable wheels which can be adjusted to run behind the topper. 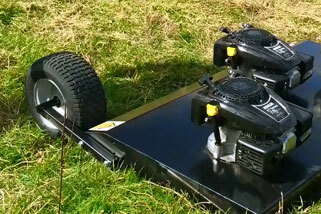 Smokey Goat towable topping mower! Left: "Easy Start" Kohler engines with 2 year warranty NZ Wide. 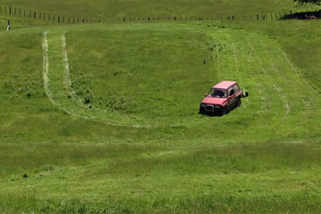 Right: Topping paddocks made easy! 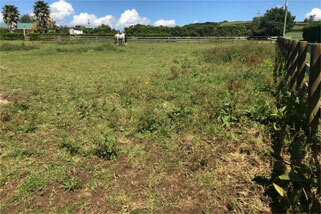 Above: Before and after using Smokey Goat topping mower on horse paddocks full of weeds and docks. Scroll down for more testimonials! 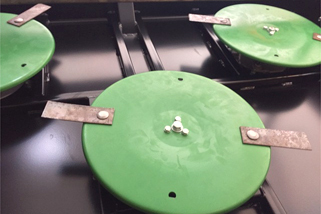 This twin engine topper features bigger disks underneath to allow the 1200mm cutting width and is best suited to those topping easier grassed areas or normal grass pastures on a regular basis. Easy wind-up handle to adjust cutting heights, from approx 30mm to 180mm high. This topper features 3 engines giving it excellent cutting power across the 1200mm width, and is a great machine for topping a wide variety of grassed areas, pastures, weeds etc. Now features an easy wind-up handle to adjust cutting heights, from approx 30mm to 180mm high. Excellent value and very versatile all-round topper, ideal for lifestyle blocks. Our most popular model topper! 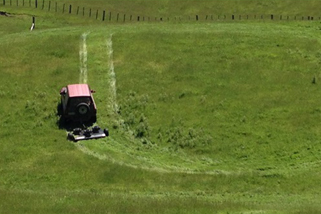 Our biggest topping mower at 1500mm wide, this machine has a robust steel frame and two adjustable Horticulture Wheels which means you can convert the wheels to both run out the back of the topping mower, enabling you to manoeuvre close to fence lines & posts. 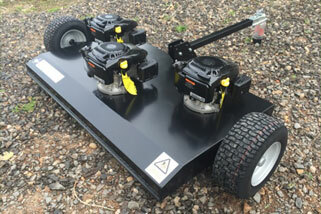 Includes a standard Jockey Wheel for ease of use when wheels are placed in the horticultural postition. Manual Cutting Height Adjustment ranging from approx 60mm to 250mm high. An excellent topper for use on either your lifestyle block pastures or orchards / horticulture rows. 1200mm Tripe Engine Smokey Goat Topper with wind-up handle for easy adjustment of cutting heights. Standard Trailer Hitch, easily towable by a quad bike, ATV, car etc. and come with a 2 year NZ Wide Kohler warranty. Full Safety Skirt surrounding the whole body frame to enhance safety, greatly minimise debris scatter and provide anti-scalping measures. and to help minimise scalping. 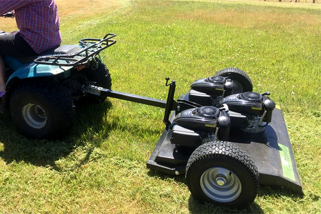 Direct drive blade system - blades can be purchased at most mowing stores, or from the topper manufacturers, and replaced individually as needed. The direct drive disks underneath each engine can hold 2 or 4 blades depending on the cut required or material being cut. Two width Toppers available: 1200mm wide or 1500mm wide. 3mm steel body and 6mm steel sides on the 1200mm toppers. 4mm steel body and 6mm steel sides on the 1500mm topper. and allow mowing close to fencelines and orchard rows / posts. Two Adjustable Horticulture Wheels on the 1500mm topper (which means you can easily convert the wheels to both run out the back of the topping mower) enabling you to manoeuvre close to fence lines & posts. 1200mm topper weighs approx 120kg. 1500mm topper weighs approx 150kg. 1200mm topper total width (including wheels) is 1680mm. The 1500mm topper total width (including wheels) is 1960mm, or 1510mm when both wheels in full Hort mode. Proudly NZ Made by professional engineers with excellent customer service and support. User Instructions and Engine handbooks sent out with each new Topper purchased. Very Competitive Price including Free Freight NZ Wide to your nearest Mainfreight Depot. All prices include FREE FREIGHT NZ WIDE to your closest Mainfreight depot. 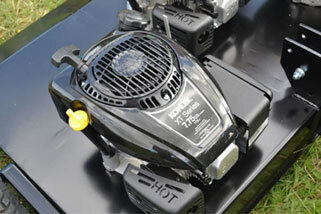 Smokey Goat 1200mm wide triple engine topping mower, being used on lifestyle block. "Hi Diana, Just wanted to advise that the Topper is awesome! Got it home last Saturday, had it operating an hour later and topped some paddocks, worked great and a well-made solid product, so much cheaper than a tractor/slasher as not really needed on our lifestyle block. Unfortunately my wife has now stopped me playing as I started topping her horse paddocks that she needs for them! Oh well it's all set up behind the ATV ready for the next job, thanks again." 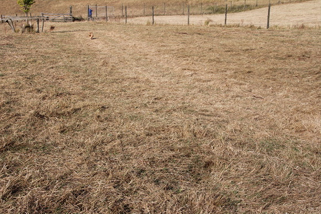 Smokey Goat 1500mm wide topping mower, being used on lifestyle block. "We are really pleased with the Smokey Goat topper. It has chewed through all of our rushes. Our neighbours (and rellies) reckon we’re making rushlage! The paddocks look so much better. With the Smokey Goat and spraying we should be able to at least control the rushes. In future will get them when young and small. A visitor saw the "Goat", admired it, asked what it was for, said it wouldn’t cut rushes. My partner said look at the paddock (a few over). "Oh wow" was the response!" 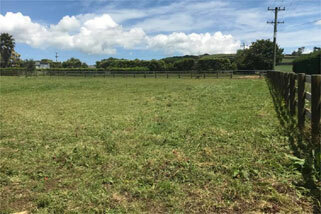 Smokey Goat 1200mm wide triple engine topping mower, being used on horse paddocks. "Thanks for sending out our spunky new Smokey Goat paddock topper! 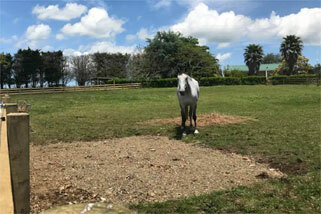 Started first time and has turned Ollie and Candy’s horse paddock from messy to gorgeous! Super stoked with it, thanks so much. Now the poor abused ride-on lawn-mower can stick to what it’s actually designed for!" (See Tanya's before and after photos below). "Many thanks for making this such an easy decision to buy from you! Took my new toy out for a test run. Love it! Really really love those motors...easy start first time! Thanks again." 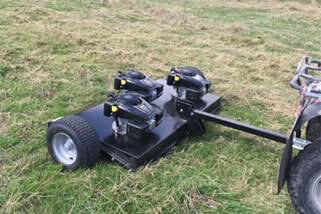 Smokey Goat 1200mm wide triple engine topping mower, being used on small farm / lifestyle block. 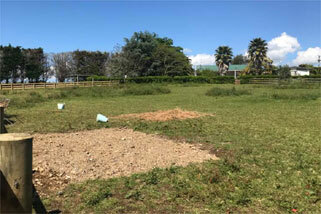 See customer photo after topping tall thick gorse (right). Very impressive results from the Smokey Goat Topper! 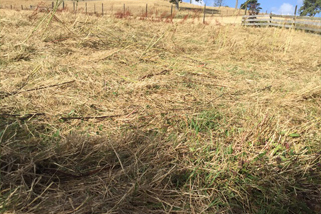 Above and Below - This was a paddock that had dock & chickweed in it. 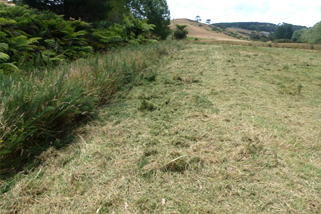 The grass had grown long, fallen over and then had a mob of 18 month steers in it who had trampled it down so alot of the grass was lying flat on the ground. These clients tried topping at the 2nd lowest setting first (which cuts at aprox 100-120mm) but it was still too high for this paddock, so they lowered the topper to the first setting (which cuts at approx 60-80cms high) and drove approx 5-7kmph. 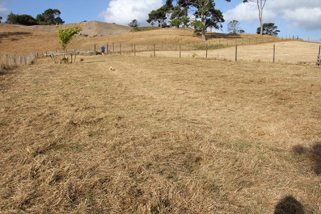 The two pictures Above show the paddock before topping and the two pictures Below show after topping. Above - Topping thick grass and thistle patches with the 1500mm Smokey Goat Topper behind a car in Rotorua. This paddock was topped on the 2nd from bottom setting (cuts at approx 100 - 120mm) which is often ideal for allowing good cut results while also maintaining grass recovery in summer. Chester Farm, Paeroa, New Zealand.